Our first costume made of real leather! This customer came to us with a drawing of a sadly unknown artist, asking us to design a costume based on it. soon we found out we had to learn new techniques; leather working using various (cutting) methods as well as painting it. 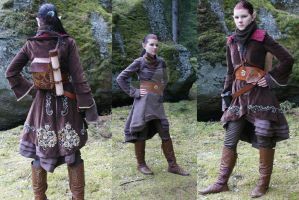 The costume consists of a leather corset top, a belt with a fabric skirt and shoulder- and arm protection. Next to that there’s a cape wit large hood, a circlet and a necklace. We painted the leather in various shades of red and gold on the carvings. The necklace too has been painted in the same type of gold to match the rest. The circlet is painted in red and green on the tropical flower with a gold wash. The gemstone we used is aventurine, that went well with both the customer and the original drawing. We even painted the leather cord that closes the corset and the vambraces by dipping it in a paint bath, to make it match the rest of the costume. We are very content with this magical creation.